You got 1 entry just for participating, 1 entry if you correctly guessed who would have the most fantasy points, either Peyton Manning and Matt Ryan, according to NFL.com scoring and 1 entry if you guessed the combined total passing yards within 25. It was a fairly even split when it came to picking the better fantasy QB this week. 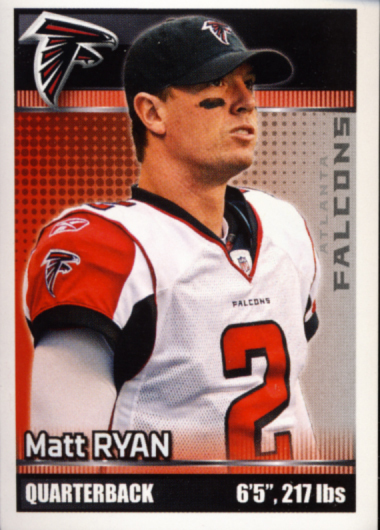 Matt Ryan came away with the win on that one, 18.66 points to Manning's 7.54. 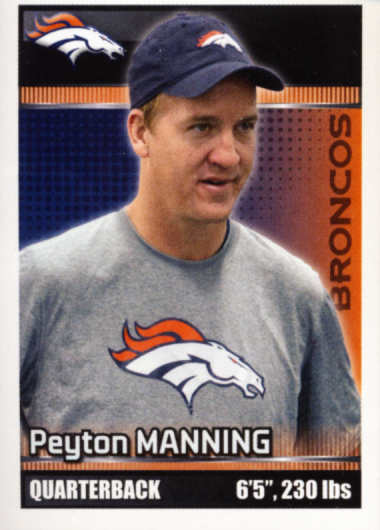 As for passing yards, Manning was on top for this stat, 241 yards to Ryan's 219. So the total combined passing yards was 460. Any guess between 435 and 485 would have gotten you that extra entry. The real surprise was from all 3 sources, the blog, Facebook and Twitter, only one of you came within 25 yards total passing yards. Congratulations goes to Mini Groover who guessed 475. We will be playing All About Cards Fantasy Football with week 3 of the Panini Stickers Players to Watch and there will be more chances to get in on our NFL POD promotion.